SF3 continues the SF tradition of giving all huge characters a down+fierce belly splash. As you've probably heard, great animation abounds. Every single fighter just feels alive as they juke and jive about, be it in an idle animation, a taunt or a straight-up attack. The sensation of watching one of the better animated Saturday morning cartoon shows gripped me more than once. The best example of this comes in the beautiful, talented and nubile Capoeira fighter, Elena. Simply letting her idle gives you a wonderful show of just how talented the 2D artists at Capcom really are. The controls are top notch, assuming of course that you own an arcade stick or one of the third-party fighting pads. Poor Capcom. SF3:DI is such a good game with such solid controls that Sega should consider making a public apology for the crappiness of their own controller. It stands in the way of a perfectly good game. However, by setting the game speed to Turbo7, I was able to squeeze a slightly better performance out of my pathetic little Dreamcast d-pad. I was also able to make my thumbs sore since playing at this speed requires your thumb speed to increase as well. Speaking of setting the game speed, both versions of the game offer up incredible amounts of customization. Aside from the standard issues of setting difficulty and time limits, you can adjust the number of rounds, the graphics displays for super moves, the amount of damage attacks do, and even how the life meter behaves. (You can set the game to allow you and your opponent to heal over time, making for a truly burly battle). This kind of customizability can greatly extend the replayability of any title, and does so especially well in a fighting game. I highly recommend trying what I and my friends did. Set the round limit to one, the speed to Turbo7, the damage meter to full and the Super Art Gauge to max... then have at it. The coolest side effect of having both SF3:NG and SF3:SI on one disc is that, much like movie lovers with DVDs full of deleted scenes and director's commentary, you can really trace the development of the game. While SF3:NG is a perfectly good addition to the SF family, SF3SI:GA has a bit more polish to it. The backgrounds are generally prettier (though fewer in number, oddly enough), the interface displays are more animated, there are two more characters to pick from and the story is slightly more accented during the final battles. The backgrounds are very detailed, but don't show the same level of improvement that the character animation does. As mentioned above, it is very cool that Capcom gave us two versions of the game on one disc. Unfortunately, they are waiting to release the third iteration of SF3, known as Third Strike. Third Strike gets released in Japan today, June 28th. I don't know about you, but I would happily have waited until Christmas to get my hands on an American disc with all three versions of SF3 on it (especially with the recent US release of Street Fighter Alpha 3). Also, since both versions of the game use the same art assets (aside from the aforementioned backgrounds), you should note that you will be seeing a lot of the same stuff no matter which you choose to play. For example, all of the characters appearing in both versions have the same animations, voices, and final cut scenes. I would have liked the option of one big uber SF3 where all the assets were combined into a single product. The multitude of backgrounds and the ability to play any of the characters available in both versions would have been highly welcomed. Now, maybe it's the old fogey in me talking, but what happened to all the old characters? I feel like a classic Trek fan when Next Generation hit the air. Sure, I see Ken and Ryu, but where are Blanka, Zangief and Guile? 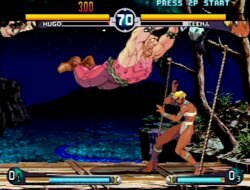 This is even more disconcerting when you start to play and realize that Necro is more or less Dhalsim, Hugo is more or less Zangief, and so on. Almost every character here is a parallel of an older character. I'd rather have old friends around than new ones who act just the same. Music... there was music? Mr. Cross and I can still hum the original SFII music. Mr. Cross can even tell you what the variations were for each stage. I had to reboot my Dreamcast just now to even be sure there was music in this game. For shame, Capcom. I want the old bah-dah-dup-da-dah of SFII, not the tasteless pabulum you've thrown our way this time. My last real gripe is that SF3:DI doesn't give us as many Dreamcast specific features as Alpha 3 did. 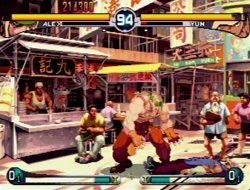 While Alpha 3 got Team Battle, World Tour, Network, Survival, Dramatic Battle, Versus Dramatic Battle, and Final Battle, SF3:DI merely offers Arcade, Versus and a half-assed Training mode. I feel left out in the cold on this one. While a lot of gamers are still dazzled by the shiny objects that are Soul Calibur and Dead or Alive 2, the Street Fighter series continues to offer a depth of play that allows masters of the game to truly be masters. Anyone who considers themselves a fighting game fan should own this title. Anyone who has never played Street Fighter but enjoys Soul Calibur should pick this up and see what a real fighting game is all about. Highs: Great animation, superb control (on anything other than a standard Dreamcast controller), best 2D fighting on the market. Lows: No special Dreamcast-only features, music is a let down. Comments on this review? Mail Feedback.